This 2 Bedroom, 2 Bath, first floor condo with Wireless Internet access is located on the scenic Intracoastal Waterway at Waterway Village @ River Oaks Golf (27 holes) , 1 mile from the spectacular International World Tour Golf Links, 10 minutes from the Myrtle Beach International Jetport, and 5 miles from the beach. You will be very comfortable in this 1,000 square foot unit which sleeps up to 4 people. There is a large L-shaped outdoor pool and hot tub overlooking the Intracoastal waterway, indoor pool, tennis court, putting green and basketball hoop all on property. Picture yourself relaxing and sipping on your favorite drink while watching the boats on the Intracoastal Waterway from the large screen porch that not only overlooks the waterway but also the outdoor pool. I honestly believe that once you rent this unit that you will want to come back again and again! This unit is available year-round and is very reasonably priced because I'm passing on the savings of not having to pay a commission to a rental agency to you! This unit is in a perfect location because you are close to all the following attractions: over 100 Championship Golf Courses, more than 1500 Eateries, Cal Ripken Experience, Deep-Sea Fishing, Dolly Parton's Pirate show, Casino Cruises, Carolina Opry, Barefoot Landing Shops & Restaurants, Alabama Theatre, Medieval Times, Legends In Concert, Broadway at the Beach, Antique Shops, House of Blues, Awesome Miniature Golf Courses, Scenic Riverboat Tours, Myrtle Beach State Park, North Myrtle Beach, Surfside Beach, Museums, Zoos, an Aquarium, Water Parks, Amusement Parks, Carolina Safari Jeep Tours, nightlife and Lots More! The condo is updated yearly. Amenities: Wall mounted 46' Samsung Smart TV, WiFi Internet access, Central Air/Heat, 3 Cable TVs, DVD, King Size Bed, 2 twin beds, leather couch with 2 recliners, leather rocker/recliner, breakfast bar, fully equipped kitchen including a smooth top stove, full size refrigerator, dishwasher, built-in microwave, coffee maker, dishes, cookware and utensils. Also has WiFi Internet access, Key-less door lock, full size washer & dryer, 6' x 24' screen porch overlooking Intracoastal waterway, boardwalk along the waterway, lighted pier, tennis court, indoor pool open year-round, outdoor pool & hot tub which overlook the waterway, on-site security including a gated entrance. Activities: There are videos and games available for your enjoyment. Keurig 2.0 and a regular coffee maker. Another great week in Myrtle Beach. Sun, swiming, tennis, golf and Beach. Glad the condo worked out perfect for you. It's hard to put into words how nice this condo is. First Don is a pleasure to work with and is very prompt answering any questions. As far as the condo, it's not only beautiful it's also very comfortable and well maintained. The location is perfect for watching boats on the Intracoastal Waterway and just relaxing in the screened in porch. Thank you Don!! Thank you very much for the outstanding review!! Glad you were real comfortable staying in the condo and you enjoyed relaxing on the screen porch while watching the boats go bye. I hope you come back for many more vacations at my Waterway condo!! The condo was perfect, and everything we needed. Condo was clean with all needs provided... it was right on the waterway with screened in porch, which made for great morning coffee views. Pool and hot tub were right next to condo and kept very clean. Security and residents were all so friendly !! Perfect driving distance to shopping, the beach, and water park! Security deposit was refunded in a very timely manner. Don was excellent to work with. Would absolutely recommend this condo ! Glad to hear the condo was perfect for you!! I also love having coffee and breakfast on the screen porch to enjoy the weather and the boats on the waterway. Pleased to hear that the location was very centralized to all the attractions that were of interest to you. Thanks for the 5 STAR recommendation!! Great place. Clean and comfortable. Everything was great! Place was very clean and comfortable. Exactly what we needed for our stay. Thanks for choosing my Waterway condo for your vacation and for the 5 star rating!! Please tell all your friends and family about .. My Myrtle Beach Condos . Come back soon!! Enjoyed a wonderful week here while in town for an event at the convention center. The condo was clean and had everything I needed for the week. The enclosed porch was a relaxing space for reading and the outdoor pool was great too! Don was so pleasant to work with and answered any questions I had. Looking forward to returning here. Thanks for the terrific review! 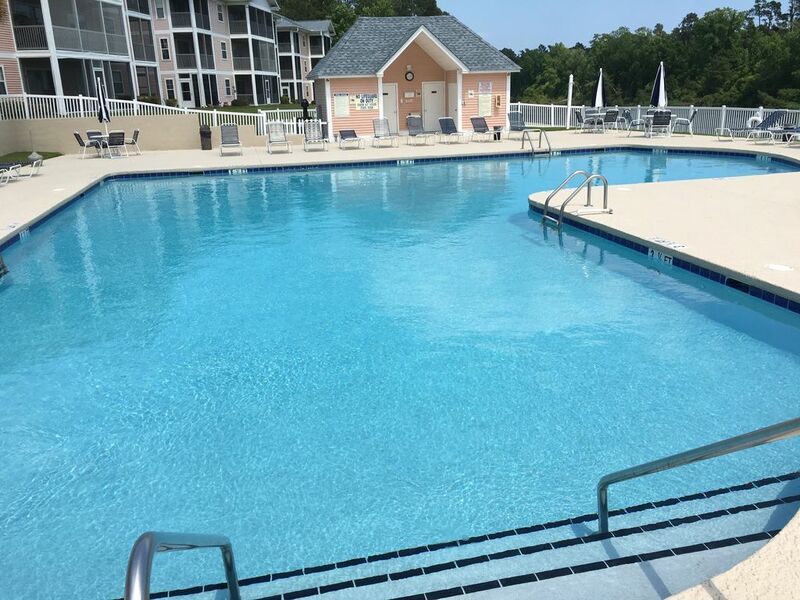 Happy to hear you were satisfied with the cleanliness, the amenities, the porch and the outdoor pool. Glad the condo worked out so well for you and that you are planning a return visit. Looking forward to having you back again :) !! If your looking for a stress free vacation that is in a safe gated community this is it! We can’t thank you enough! We want you to know the pictures you have on VBRO don’t do your place justice, the upscale of decor , cleanliness and accommodations your condominium offers. I enjoy cooking for my husband and your place was completely setup for me to start cooking. Surprised me how quiet the condo’s are, we have stayed at other places that we very busy and loud, this stay was even during a baseball playoff week, players from colleges we met at the pool were so nice and polite, and surprising we heard nothing. Shopping is very close by and easy to to get to. We were only steps away from the pool ,and the hot tub was so delightful at nighttime after long walks at the beach or shopping. Just sitting on the screened in porch with the water front right in your backyard was so relaxing. Being a Navy Brat and watching the boats go by.. very nice! Having my morning coffee while the sun was rising and getting a glimpse as the ships set off for their work day was so impressive and brought back a lot of memories of my dad.. The security guards are extremely friendly and helpful at all times. The families who live there full time or part time during our vacation went out of their way to welcome us at the pool and give us the best local places to try for food and fun. We met new friends , who have asked us to be sure to come back. That was so nice . We felt very welcomed and really had a great time. We look forward to our next vacation here. Thank you very much for choosing my Waterway Village condo for your vacation and happy to hear that you felt welcomed and had a great time! Glad you enjoyed watching the boats go bye from the screen porch and that you made a lot of friends there. Please come back soon, I enjoyed having you as guests :).